It's started to cool a little these last couple of days, despite the hot weather at the beginning of the week. Am I complaining? Not so much! I've figured faux-leather does not work too well when it's super-hot so I'm excited to get to wear this skirt a little more. Your skirt is so cute! And I adore your bag - very casual yet chic! Stunning look, I love your asymetric skirt to bits! great look love the bag! You have a perfect mix of punk and classic styles going on in this look. I've been seeing those asymmetrical skirts everywhere and I really like how unusual they are. Cool look! Gorgeous skirt and shoes! 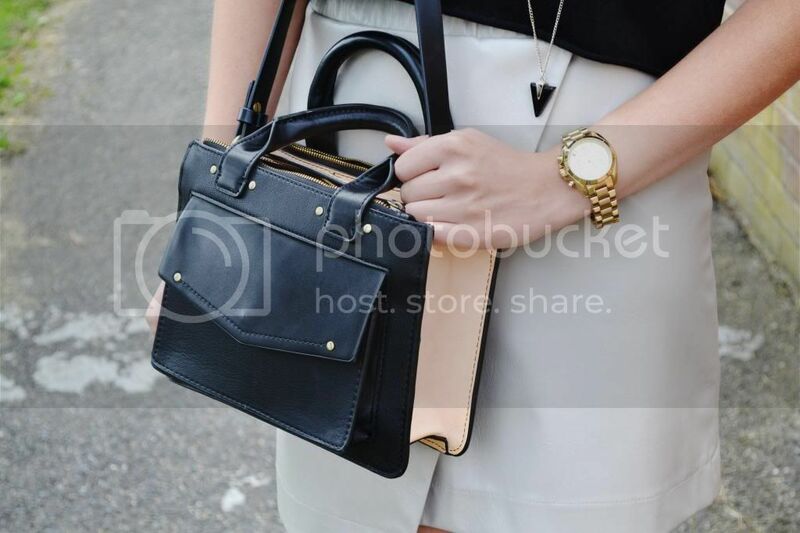 Love the accessories you paired with this look- definitely adds some chic finishing touches! Thanks for the outfit inspiration! Your skirt and handbag are perfect! I love them both. you've got a great blog here! You look great, beige with black is a classic- and this outfit is seriously perfect for this coming fall season! I am doing a Giveaway Contest right now! Enter for a chance to win some awesome Midi rings and custom illustrated notebooks from an awesome designer! I am also a Fashion Blogger for Popsugar Select (www.popsugar.com) So check me out there as well! i think this is gorgeous!! i just love the asymmetrical shape of your skirt!!! that purse is so chic!! You look absolutely stunning! I am loving that bag and those boots. You have an amazing sense of style! I am your new GFC follower.. Your outfit is soo cute! I love your skirt and the black top is perfect. Hey there, loved your blog, just followed you on GFC,(228) would you mind to follow back? Great neutral outfit, doll. You look super chic! Hi Lucy, great style and love the messy hair !! nice outfit! the skirt is beautiful! Hey Lucy, thanks for your comment and I would love to follow each other! I really love your skirt and faux leather is so perfect for cooler Summer days. Love the color of your skirt and you have great style! Great skirt! Follow you back! nice outfit and you are very beautiful! Really great! I love your skirt and bag!